Dahlgren, T.G., Wiklund, H., Rabone, M., Amon, D.J., Ikebe, C., Watling, L., Smith, C.R. & Glover, A.G. 2016. Abyssal fauna of the UK-1 polymetallic nodule exploration area, Clarion-Clipperton Zone, central Pacific Ocean: Cnidaria. Biodiversity Data Journal 4: e9277. doi: 10.3897/BDJ.4.e9277. Reference page. Margulis, L.; Schwartz, K.V. 1998: Five Kingdoms: an illustrated guide to the Phyla of life on earth. 3rd edition. Freeman: New York, NY (USA). ISBN 0-7167-3027-8. 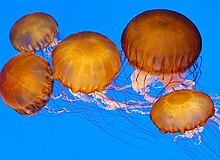 For more multimedia, look at Cnidaria on Wikimedia Commons.